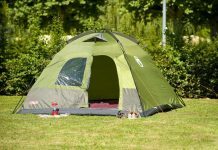 When it is time for a new tent there are a few considerations to think about before buying. 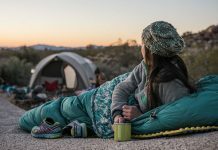 Keep in mind your budget, where and how you will be using the tent such as if you will be backpacking and must carry the tent along with you and what additional features are most important for your comfort. 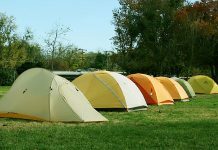 Think about how many people will be using the tent and whether you are going to use an air mattress with it. 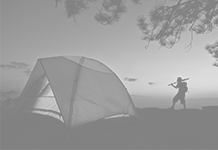 If you will not be using your tent [Camping Tent] to backpack, kayak or canoe, then the size and weight does not matter. A two person will accommodate just that, two people. Once your air mattress or sleeping bags are inside, there will be very little room for anything else. 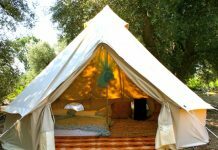 If you can afford a four person tent then you will have more room to stretch your elbows and store some gear inside. 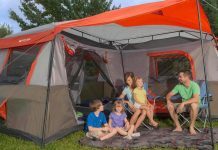 If a family of four is going to be using only one tent your best bet is to buy a tent for six people. 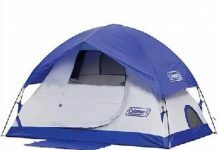 If you will be camping in all kinds of weather then a rainfly (tent umbrella) feature is what you should seek. A tent repels water while a rainfly is waterproof and the farther it comes down the better. Check the stitching on a tent. 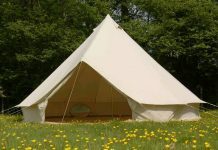 If you pull at the seams and you can see through it you can be assured that the tent will spring a leak in foul weather. 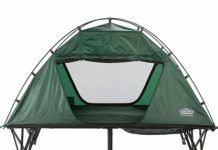 Go for a tent that has double stitching and seams that are folded. To keep out the bugs a tent that has meshing for noseeums is the best type of material to keep pesky insects from invading your tent. A vent on the roof is another feature you may like as the air will circulate when you open it at night. This will also eliminate any condensation that would have otherwise gathered. Additional features you might appreciate are a place to hang a lantern on top and a small cubby on the ceiling as well to store items that might be sharp or you don’t want to take the chance of crushing. 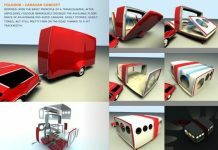 In conclusion, the larger the tent the roomier it will be and with foul weather features you can be sure that you will be comfy and cozy when it is raining cats and dogs outside. 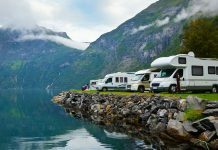 Nothing is worse than being wet and cold when you are on a camping trip.